Christian Poltéra was born in Zurich. After receiving tuition from Nancy Chumachenco and Boris Pergamenschikow, he studied with Heinrich Schiff in Salzburg and Vienna. As a soloist he works with eminent orchestras including the Munich Philharmonic Orchestra, Leipzig Gewandhaus Orchestra, Los Angeles Philharmonic, Oslo Philharmonic Orchestra, Orchestra dell’Accademia Nazionale di Santa Cecilia in Rome, Orchestre de Paris, BBC Symphony Orchestra, Orchestre Révolutionnaire et Romantique and Chamber Orchestra of Europe under such conductors as Bernard Haitink, Riccardo Chailly, Christoph von Dohnányi, Andris Nelsons and Sir John Eliot Gardiner. He devotes himself intensively to chamber music together with such musicians as Gidon Kremer, Christian Tetzlaff, Leif Ove Andsnes, Mitsuko Uchida, Lars Vogt, Kathryn Stott and Martin Fröst, and with the Auryn and Zehetmair Quartets. Together with Frank Peter Zimmermann and Antoine Tamestit, Christian Poltéra has formed a string trio, the Trio Zimmermann, which performs at the most prestigious concert venues and festivals all over Europe. 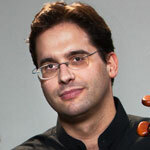 In 2004 he received the Borletti-Buitoni Award and was selected as a BBC New Generation Artist. He is a regular guest at renowned festivals, such as Salzburg, Lucerne, Berlin, Edinburgh and Vienna, and made his BBC Proms début in 2007. Christian Poltéra’s discography, which has won acclaim from the international press, reflects his varied repertoire that includes the concertos by Dvořák, Dutilleux, Lutosławski, Walton, Hindemith and Barber as well as chamber music by Prokofiev, Fauré, Beethoven and Schubert. Christian Poltéra plays the famous cello ‘Mara’, built in 1711 by Antonio Stradivari. For further information please visit Christian Poltéra's website.